Once you have a pixel selection in place, it can be modified in several ways. You can modify your pixel selection by enlarging or shrinking it, applying a feather to its edge, and/or by smoothing its curve. These options are available from the Select menu as Grow/Shrink, Feather, and Smooth, respectively. In the drop down from the main Select tab, all sub selections are greyed out under all circumstances that I have tried. 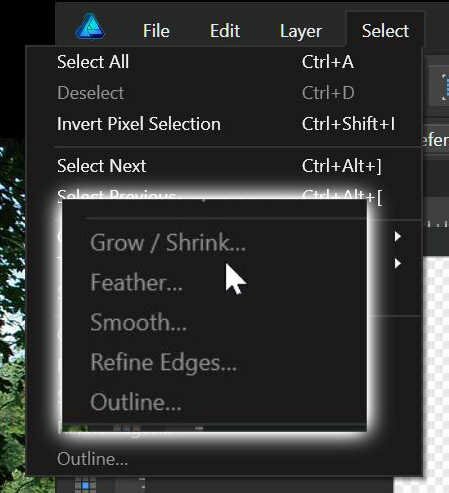 These include: Grow/Shrink; feather; smooth; refine edges; and outline. Is this a program glitch or SUE? You need to create a pixel selection for these commands to become active. Do you have a pixel selection active when you try to use them?